Rectangular resin wicker garden table cover Kaiman and ottoman. Polyurethane cover 120 grs / m2. UV resistance and water repellent surface. Cover for table. 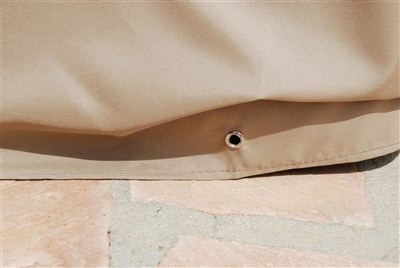 Cover dimensions: 1230 x 760 x height 400 mm. Cover with several eyelets low for possible lacing in case of wind. Lace strap not supplied.